CHARLOTTE, N.C. (AP) — NASCAR did not have its finest day at Texas Motor Speedway, where things first went awry with an erroneous penalty even before the race. Kevin Harvick won and advanced to the championship round for the fourth time in five years. His victory wasn’t all that surprising because the 2014 champion had said for months he was most looking forward to Texas because he believed it would be his winning ticket into the final four. 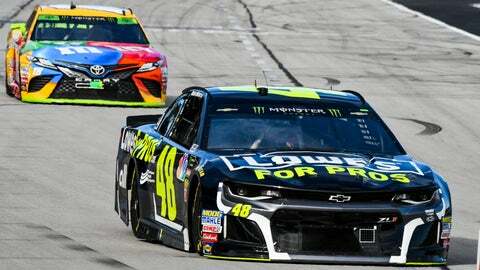 Jimmie Johnson was incorrectly sent to the back of the field moments before the race began. Officials in NASCAR’s scoring tower punished Johnson’s team for failing pre-race inspection three times. The problem? His car had only failed inspection two times, so the penalty was incorrect. NASCAR admitted the error during Sunday’s race but it was too late to remedy. Steve O’Donnell, NASCAR’s chief racing development officer, didn’t hide from the error after the event and promised steps would be taken to prevent such a blunder moving forward. O’Donnell called the mistake “unacceptable” and promised system upgrades before this weekend’s penultimate race of the season at Phoenix. Johnson, the seven-time NASCAR champion, has already been eliminated from this year’s playoffs. But he’s winless this season, just signed a new sponsor and went to Texas with just three races remaining with Chad Knaus, the crew chief who built his team in 2001. An erroneous penalty issued after he was already in his car set the tone for a rotten day that can’t be corrected. O’Donnell was also asked to explain a penalty on Clint Bowyer, who is still in the playoffs and whose team was flagged for a crew member being over the wall during a pit stop. Except the crew member in question was actually sitting on the pit road wall, though the penalty was correct because his feet were resting on the ground. Yes, a rule was broken. But it was a call that left some wondering if NASCAR has gotten too heavy-handed in enforcing a cumbersome and confusing rulebook. Had the racing been more interesting the Johnson gaffe might have become just a footnote. But the ticky-tack call on Bowyer’s team on top of it only gave fans more reason to complain. NASCAR’s on-track product has greatly deteriorated through evolving rules packages, and even O’Donnell had to admit that the entertainment was far superior in Friday night’s Truck Series race, and again in the Xfinity Series race on Saturday, to what fans got to see Sunday in the main event. Almirola’s anger was at least interesting — even if his is a misguided belief that Logano should go easy on drivers still chasing the remaining two spots in the season finale.